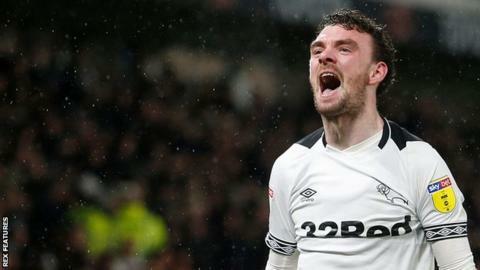 Mason Bennett's sublime volley and Scott Malone's strike saw Derby County come from behind to get their play-off push back on track with a gutsy win over Wigan Athletic. The Latics led from a Derby corner when ex-Rams man Michael Jacobs surged forward on the left and slipped a fine pass to Gavin Massey who slotted the ball under keeper Scott Carson. But the Rams, who had lost three league games in a row, levelled through Bennett's stunning volley as they improved after the interval. And Scott Malone's simple close-range finish earned victory to put them level on points with sixth-placed Bristol City. Wigan, who were five games unbeaten prior to their trip to Pride Park, have still only won once away from home in the league this season, but remain three points clear of the relegation zone. However, they will feel they should have had at least a point despite a bright start by Derby in front of a noisy home support. Derby, thumped 4-0 by Aston Villa on Saturday, began with decent urgency and threatened early on mainly through their lively top-scorer Harry Wilson. But after Massey's brilliant breakaway goal they struggled to create chances for the rest of the half, in fact, Wigan very nearly doubled their advantage through Leon Clarke's back-post header. He headed over again, this time from from five yards, when he should have scored and Derby then made Wigan pay through substitute's Bennett sumptuous improvised first-time finish. Malone's strike, after some good work by Wilson, Jayden Bogle and Duane Holmes, earned a vital win, while Martyn Waghorn almost added a third with a shot from a tight angle that hit the post in injury time. "When you're in difficult form and things are going against you, it takes character and fight to get out of it. This is as proud as I've been this season. "We have a young, transitional team. People expect it to be rosy and that we'll win every week, but it doesn't work like that. "I massively appreciate the support and the players do as well. We have a responsibility to the fans and they stuck with us. If we're going to be successful, we all have to be together. The fans were great. "Mason's goal was an incredible strike. The last time I felt like that was when Gareth Bale scored in the Champions League final [for Real Madrid against Liverpool last season]. The whole stadium gasped." "We go home with nothing so there are no positives to take for me. "We move on and we have Reading on Saturday. To retain our status in the league we need to win games. "I don't know if their first goal was a worldie or a fluke but the whole atmosphere and the momentum of the game changed with that moment." Match ends, Derby County 2, Wigan Athletic 1. Second Half ends, Derby County 2, Wigan Athletic 1. Attempt blocked. Sam Morsy (Wigan Athletic) right footed shot from the centre of the box is blocked. Assisted by Lee Evans with a headed pass. Attempt missed. Leon Clarke (Wigan Athletic) header from the centre of the box misses to the right. Assisted by Kal Naismith with a cross following a set piece situation. Martyn Waghorn (Derby County) hits the left post with a left footed shot from the left side of the six yard box. Assisted by Jayden Bogle with a cross. Substitution, Derby County. David Nugent replaces Harry Wilson. Attempt missed. Nick Powell (Wigan Athletic) right footed shot from outside the box is too high. Assisted by Leon Clarke. Offside, Derby County. Harry Wilson tries a through ball, but Martyn Waghorn is caught offside. Attempt missed. Nathan Byrne (Wigan Athletic) right footed shot from outside the box is too high. Assisted by Lee Evans. Delay in match Mason Bennett (Derby County) because of an injury. Goal! Derby County 2, Wigan Athletic 1. Scott Malone (Derby County) left footed shot from very close range to the bottom left corner. Assisted by Jayden Bogle. Attempt missed. Jayden Bogle (Derby County) right footed shot from the right side of the box misses to the left. Assisted by Harry Wilson. Attempt blocked. Harry Wilson (Derby County) left footed shot from outside the box is blocked. Assisted by Duane Holmes. Attempt missed. Leon Clarke (Wigan Athletic) left footed shot from the centre of the box is close, but misses to the right. Assisted by Nathan Byrne with a cross. Attempt saved. Lee Evans (Wigan Athletic) right footed shot from outside the box is saved in the bottom right corner. Attempt blocked. Nick Powell (Wigan Athletic) header from the left side of the six yard box is blocked. Assisted by Lee Evans with a cross. Corner, Wigan Athletic. Conceded by Richard Keogh. Fikayo Tomori (Derby County) is shown the yellow card. Corner, Wigan Athletic. Conceded by Fikayo Tomori. Corner, Derby County. Conceded by Kal Naismith. Corner, Derby County. Conceded by Jamie Jones. Attempt saved. Duane Holmes (Derby County) right footed shot from outside the box is saved in the centre of the goal. Assisted by Mason Bennett with a headed pass. Attempt missed. Michael Jacobs (Wigan Athletic) left footed shot from the left side of the box misses to the right. Assisted by Leon Clarke. Harry Wilson (Derby County) has gone down, but that's a dive. Attempt blocked. Tom Huddlestone (Derby County) right footed shot from the right side of the box is blocked. Assisted by Duane Holmes. Goal! Derby County 1, Wigan Athletic 1. Mason Bennett (Derby County) left footed shot from the left side of the box to the high centre of the goal. Assisted by Scott Malone with a cross.